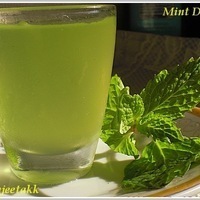 Pick the mint leaves and wash it in running water. Clean and grate the ginger. Heat water in a vessel and add sugar to it. Let the sugar dissolve; filter the sugar syrup with a thin muslin cloth. Boil it further on medium heat till the syrup becomes a bit thick, about 20 minutes. Take off heat and cool the syrup. Now add the mint leaves, grated ginger and juice of lemons. Leave it aside for 4-5 hours to let the mint flavor seep into the syrup. Add green color if required. Store the concentrate in a clean glass bottle. To make the drink, pour about 1 tbsp. of the concentrate and add water to suit your taste. This sounds really good. Going to try it at our monthly book club meeting. How nice is this refreshing cooler you are sharing with us. I thought it was a wonderful drink to make as a way to end a summer evening on the porch. Can't wait to try it! Recipe | Healthy Oats and Apple Squares – Journey of life through mom’s eyes.. Recipe & Food Styling | Infused water – Hydrating the smart way..